I read something recently that sent a shiver down my spine. Strangely it wasn't anything to do with Lotus's latest celebrity tie-in, nor its decision to unleash the German equivalent of West Coast Customs on the Hethel styling studio - "would you like Greek or Roman columns supporting your marble spoiler, Sir?" No, my source of panic stemmed from a forum thread on SELOC highlighting a worrying case of chassis corrosion. In the case of the car in the thread, it was a torn wishbone mount and the strong possibility of a chassis write-off. 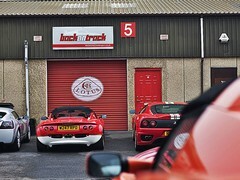 A chat to the guys at Back On Track helped alleviate some of my fears. Very few cars they've seen has had more than minor chassis corrosion, and certainly not anywhere near as severe as the car in the thread. All the same, knowing that my car had spent some of its life near the coast was enough to fast-track the suspension refresh. 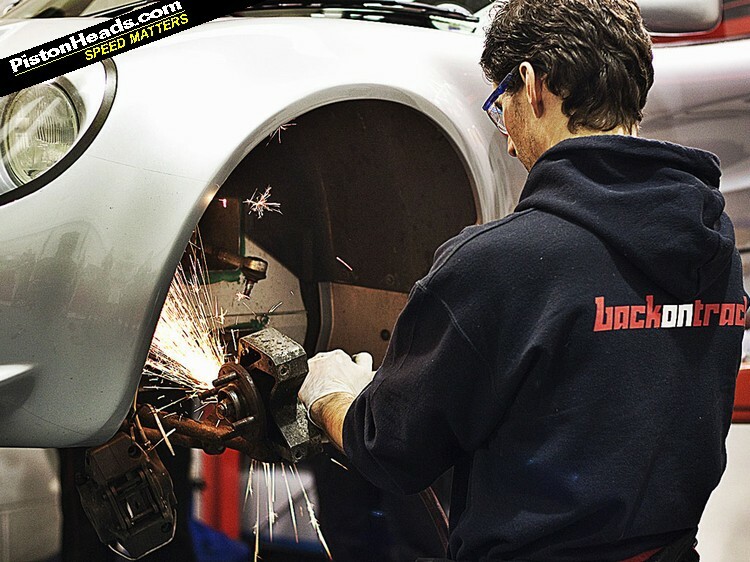 The whole process is not too far removed from grown-up Meccano, and many Elise owners have undertaken the work themselves. But without access to a garage, or even a drive, this wasn't really an option. At least I could keep the skin on my knuckles and everything could be done in a day - drive in, drive out. Removing old components required powertools! 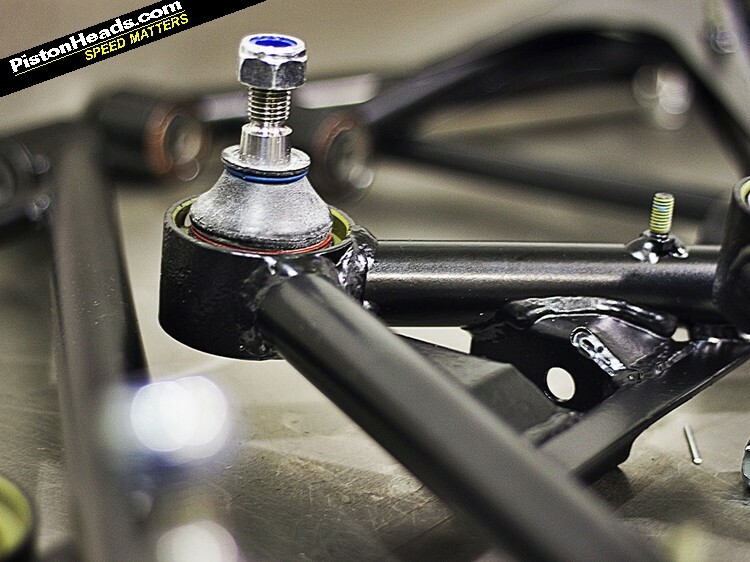 All of the freshly powder-coated wishbones had been pre-prepped with their bushings and balljoints before I arrived but the job still took all day. 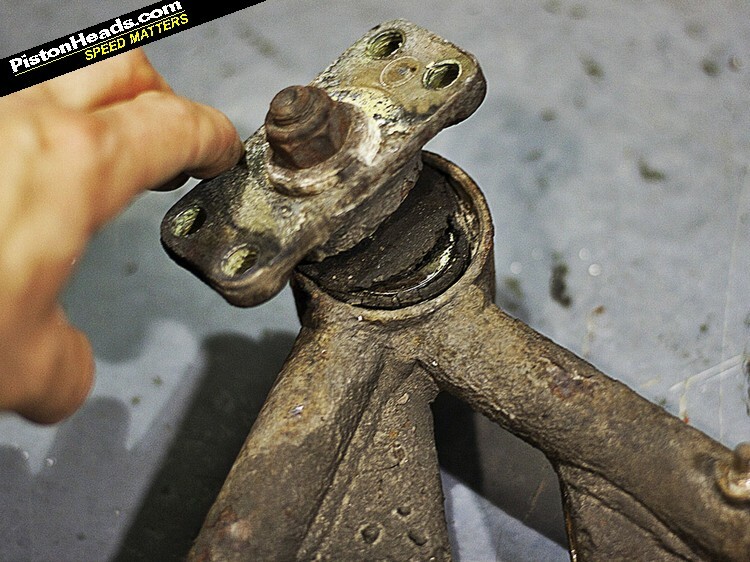 Removing all the seized old parts is a long-winded process and, as you'd expect from a 14-year-old car, both the grinder and the persuader were called into action. While I kept the boys fuelled with tea, and scrubbed away at the undertray, gradually the crusty, the rusty, the split and the perished made way for the fresh, clean, bright and shiny. 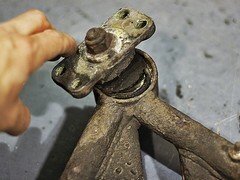 And a few pockmarks around the upper front wishbone mounts aside the chassis was given a clean bill of health. A prescription of regular check-ups, and lashings of ACF50 anti-corrosion spray, should see my Elise through another decade at least. Finally the car was off the lift, the geometry and ride height were set, and only a box of rusty wishbones reminded me of what once was. 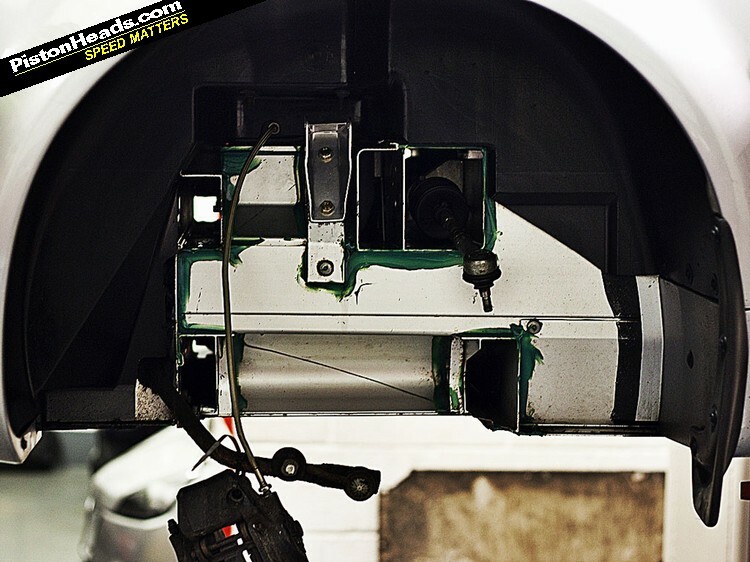 And despite their dishevelled condition, they will live to fight another day; once they've been stripped and powder-coated, they'll be ready to form the basis of the next customer's suspension refresh. It's recycling at its best. 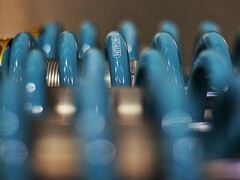 In Elise land, Bilstein, Nitron, Gaz and Quantum seem to be the most popular upgrade options. I read all the forum threads, digested the marketing spiel and picked the brains of the guys that fit these things day in, day out. 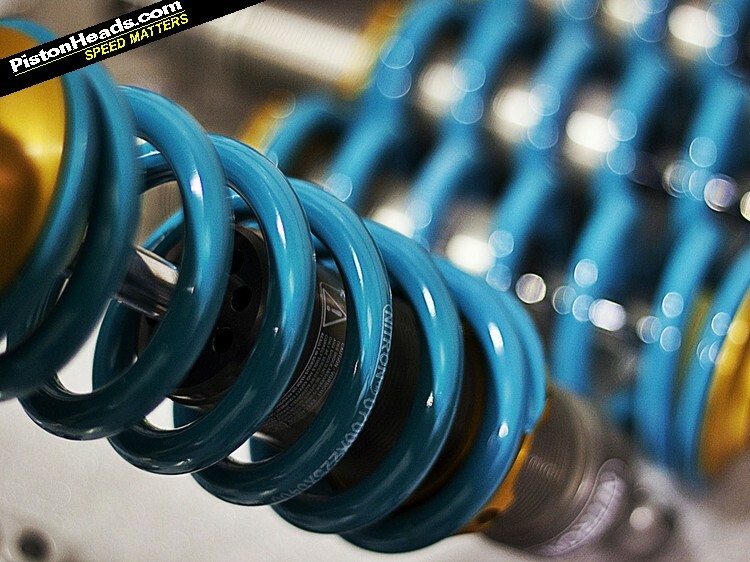 In the end Back on Track's Stef recommended the Nitron NTR Fast Road set-up as a good mid-priced option. 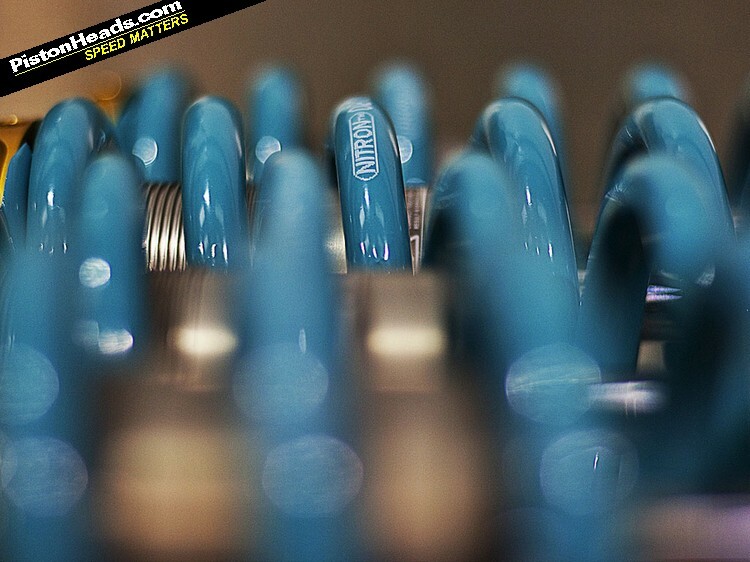 Individually dyno-tested and fully rebuildable, rebound and, more importantly, compression are adjustable in ratio via a single dial at the end of the piston, meaning that you can play with the settings without getting lost in a world of clicks. The first thing that struck me as I pulled away was just how compliant the new dampers were. 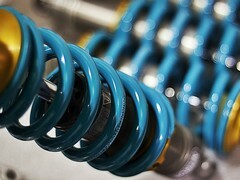 Although the springs and dampers are stiffer than my old Bilsteins, small bump sensitivity had improved considerably. It was not a result I'd been expecting, but the Nitron's spherical eyelet bearings may have reduced stiction enough to improve the primary ride. My route home also included a short but tasty bit of B-road. 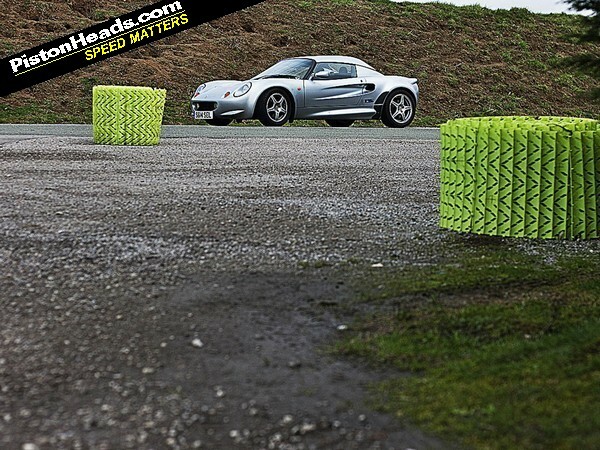 Its fast, sweeping corners feature sharp compressions that really unsettle the chassis, and even in a straight line there are enough bumps to feel like you're about to be ejected from the Tarmac. At 60mph with the worn out Bilsteins it was a wild ride. With the Nitrons fitted, the drive home was like night and day. Immediately noticeable was the improvement in stability. 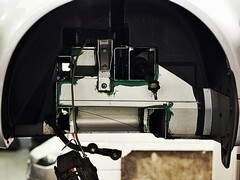 A single movement of the steering wheel was all that was needed for turn-in, and that initial input could be held throughout the turn, even over the most prominent of mid-corner bumps. And where a series of undulations would once totally overcome the dampers, the car now feels completely secure and planted. I shot the video below as a bit of an experiment, to see whether the camera could detect any of the things I was feeling through the chassis. 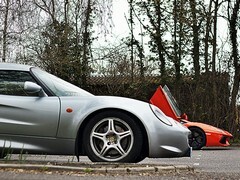 On the right is my little suspension test road driven at a constant 60mph with the old Bilsteins. The left shot is the same road, same speed, but with Nitrons. The difference in the footage is subtle, but look hard enough and you can see the greater confidence and stability in the steering and the general improvement in damping control on the bigger bumps. So a big job ticked off - one that hopefully won't have to be repeated for another decade at least - and a fantastic improvement to the one thing that really matters with an Elise - the handling. A couple of weeks later, I got the chance to enjoy the upgrades properly at one of Lotus on Track's regular days at Abbeville. I'd been meaning to make the short hop across the Channel for some time, lured by the promise of a tight, twisty track with lots of run-off. Less than an hour from Calais, it's actually 80 miles closer to home than Oulton Park and, with day returns on Eurotunnel available for as little as £40, the costs pretty much even out as well. Lotus on Track runs a relaxed, friendly event. Most drivers are current or past Lotus owners, and a variety of soft-top sports cars are also welcome meaning almost as many Caterhams had made the journey over as Elises and Exiges. I had to doff my hat to one particular chap who'd managed to shoehorn a full set of track wheels, along with an aero screen, tools, a jack and a passenger into his Caterham. Abbeville is not unlike a pocket-sized version of Bedford Autodrome. Overall speeds are low but it's easy to get a good flow going and the many hairpins are great for exploring power and lift-off oversteer. I certainly did a lot of exploring, but as I soon found out on the first of half a dozen pirouettes, mastering the Elise's mid-engined layout is a delicate balancing act. Suffice to say I'm still a long way from sliding it around with complete confidence, but I'm nothing if not stubborn, so I'm determined to make this a 'when' not an 'if'. 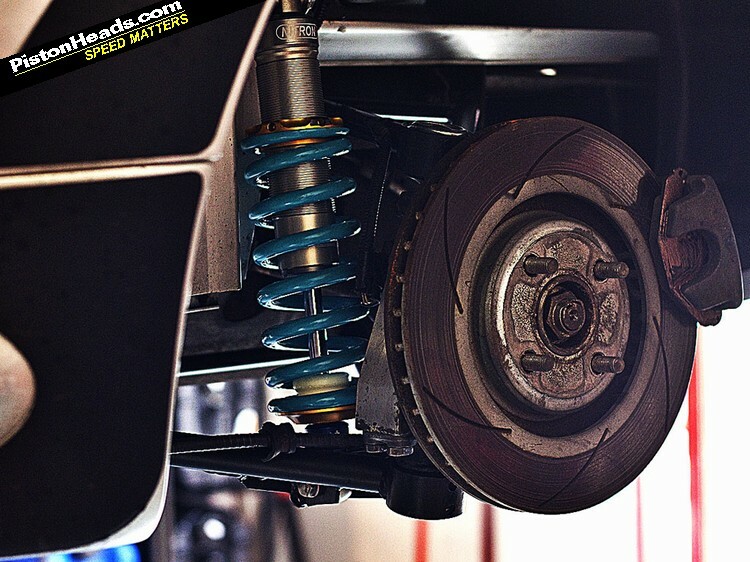 This month at a glance: Once in a lifetime suspension refurb brings new lease of life to tired limbs and joints. A Lotus joins the PH Fleet - but will it prove lots of trouble? 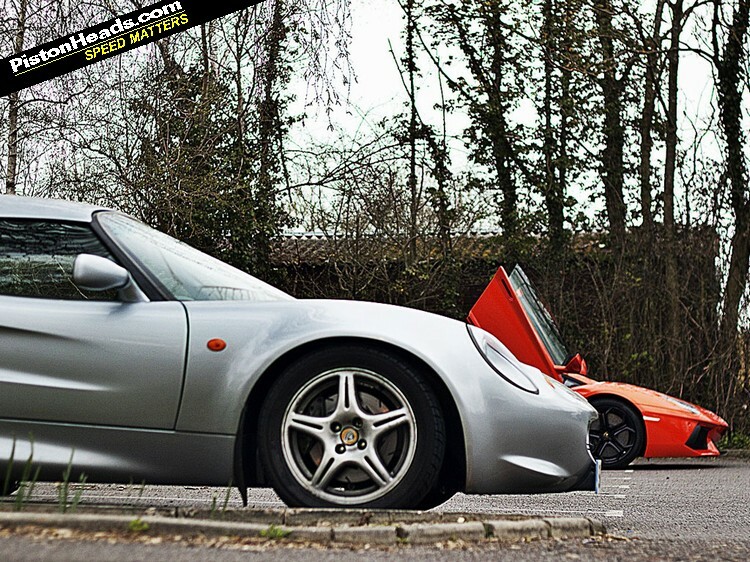 My Elise is a similar age - how much was the suspension refresh? Interesting report, good timelapse video & a lovely onboard jobby with the Aventador - excellent work Danny, very enjoyable & it only took me about half-a-cup of tea! Goodness that's nice to read. 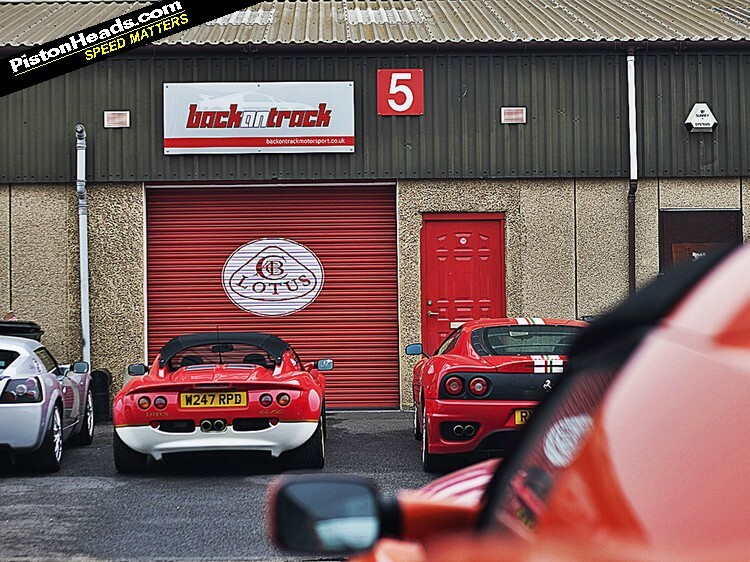 Lotus, Elise S1, gentle fettling, bit of an upgrade, trackdays, handling, ahhh. Think I'll read it again now. Thank you. Very good write up and a great time lapse and sound rack to boot. Thanks.